Opening: The Dominican Republic, 1981. One sunny day in the village of Manoguayabo, Pedro Martinez sits in the shade and watches the older boys play. He wants to play too. But his big brother, Ramon, says he is too little. The boys are using a hard ball, and Ramon says it’s too dangerous. Pedro is mad, but he knows Ramon is just looking out for him. Ramon is always looking out for Pedro. Despite his anger, Pedro watches Ramon pitch. He is the greatest pitcher Pedro has ever seen. 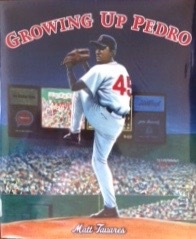 Brief synopsis: (from barnesandnoble.com) Before Pedro Martínez pitched the Red Sox to a World Series championship, before he was named to the All-Star team eight times, before he won the Cy Young three times, he was a kid from a place called Manoguayabo in the Dominican Republic. Pedro loved baseball more than anything, and his older brother Ramon was the best pitcher he’d ever seen. He’d dream of the day he and his brother could play together in the major leagues—and here, Matt Tavares…examines both Pedro Martínez’s improbable rise to the top of his game and the power that comes from the deep bond between brothers. Matt Tavares has written a number of excellent books on baseball. Choose a few to read and do an author study. Do some math with the stats in the back. When kids see the athletic stars on TV, that’s only a piece of the story. Learning how they got there and what they do with their success are vital parts of the tale that are full of life lessons that guide and inspire. This is a classic story in many ways. It’s rags to riches – a modern sports Cinderella story that boys will love. It’s about the bond between brothers. It’s about perseverance and the reality of hard work. The illustrations are soft, real, and beautiful. Math stats, ratamatat! Sound like a neat pick, Beth! Sounds like a book that will inspire young readers. This one has me totally fascinated – love stories like this! Thanks.